Italy's former leader, Silvio Berlusconi, will not return as prime minister even if his party wins next month's election, an ally has stated. Roberto Maroni said it was explicitly ruled out by an electoral pact between his Northern League party and Mr Berlusconi's People of Freedom (PDL). The two parties are hoping to form a centre-right government, but have not named a candidate for prime minister. Mr Berlusconi said he might take the role of finance minister. In an interview earlier, he did not explicitly rule himself out of running the premiership, saying the candidate for the post "will be decided if we win", but that it could go to PDL secretary Angelino Alfano. "Alfano could be our candidate for prime minister and I could be the finance minister," he said. Mr Maroni noted that the bipartisan pact "says explicitly that the candidate for prime minister will not be Silvio Berlusconi. Silvio Berlusconi accepted the request to not stand as prime minister." 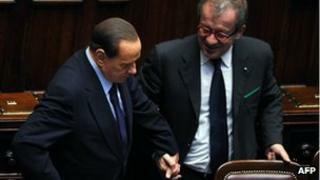 However, some observers found it difficult to believe that Mr Berlusconi would be happy serving another leader. "If Berlusconi were to win, then he would try to grab the premiership," James Walston, a political science professor at the American University in Rome, told Reuters. "I think it is very, very unlikely he is going to win. He is not trying to win, he is trying to spoil." Polls suggest the combined bloc is still some way behind the centre-left coalition headed by the Democratic Party's Pier Luigi Bersani. A survey published on Sunday suggested the PDL and Northern League would win 28% of the vote, with the centre-left about 10 points ahead, and a centrist bloc backing Mario Monti taking about 15%. The Northern League opposes immigration and wants greater fiscal autonomy for northern Italy. It has been a coalition partner in three previous Berlusconi governments - including the one which ended early in November 2011, when the long-time leader of the League, Umberto Bossi, withdrew his support and made Mr Berlusconi's position untenable. Mr Berlusconi resigned and the unelected technocrat Mario Monti took over. Mr Bossi himself was later forced to resign as head of his party as he was engulfed in a financial scandal. He denied allegations of misusing party funds.